Promise 4 Paws Dog Walk. 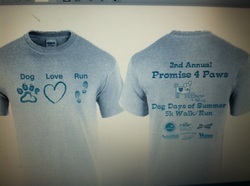 Come join us for our second annual Promise 4 Paws Dog Walk. There will be two distances of a walk/run to choose from, both starting in the Railway Grill & Bar parking lot. If you and your pooch are feeling like a longer distance, you'll want to choose the 5k route. If your dog prefers a lighter distance, especially since it might be warmer outside, a 1 mile walk/run is an option too. Or, if you are not quite sure - you can choose once you get to the different checkpoints. The route starts at the Railway Grill & Bar and then goes down 15th, past the community gardens and runs into the city trail. No matter which course you choose, refreshments and the occassional benches will be provided along the way. Don't want to walk or run? - no worries! Walking/running is not mandatory. There will be plenty of other things to do including music, food and fun! 89.7 The River will be on site providing all the music and the Railway will graciously be providing food - hotdogs, brats and all the fixings!! Yum!!! Also, is will be happy hour at the Railway so all happy hour deals will apply! Don't have a dog? - no worries! We will have several dogs for adoption that would love to walk with you. Pre-registration Cost? If you register for the walk/run before June 20, the cost is $20. This includes a t-shirt and lunch. Day of Cost? If you register the day of the walk/run, the cost is $25. This includes a t-shirt only until supplies last. Please check back occasionally for more information come as we get closer to the big day. Proceeds benefit Promise 4 Paws Dog Rescue. Here's a picture of what the shirts will look like. This year children's shirts and shirts larger than 3X are available. Just send us a message if you need a size other than what is available above.